The chiropractic system of health care recognizes the natural ability of your body to correct itself when steps are taken to restore internal and external balance. The brain controls every function of the human body. It produces all of the life energy in order to keep your body functioning and to keep you alive. This is why the brain is often referred to as the “headquarters of life” and why it is considered the most important organ. Mental impulses (life energy) generated by the brain flow (1) from the brain, (2) down to a thick master cable called the spinal cord and (3) out to the body. If something were to deprive you of all the life energy which the brain generates, you would be dead. By the same token, if we were to deprive a portion of the body of its life energy, that portion would become weak, susceptible to illness, deteriorate, and eventually die. The spinal column protects the delicate spinal cord and nerves leading from it. When the bones in your spinal column become misarranged, they can choke or irritate the vital nerves. This action causes interference with the normal nerve function and results in weak communication from the brain to the body, creating weakness and dis “ease”. SUBLUXATION: A subluxation is a bone (a vertebra) in the spine that has slipped out of its normal place, and gotten stuck – out of position. Eventually, a subluxated bone will begin to choke, then irritate, and finally interfere with the spinal nerves that carry the mental impulses to and from the brain to the body. The result is pain, improper function and weakness. Sickness and disease can result because the body is not replacing itself normally. The body is in a constant state of replacement. Proper communication with the brain is critical and essential in order for the body to replace the sick and dying cells with strong healthy cells. If the nerve is choked by a subluxation, wherever that nerve is traveling to is not getting all the messages from the brain, and therefore, will replace itself with not so healthy cells. When enough of these not so healthy cells build, you will have not so healthy tissue. Now you really have a problem! 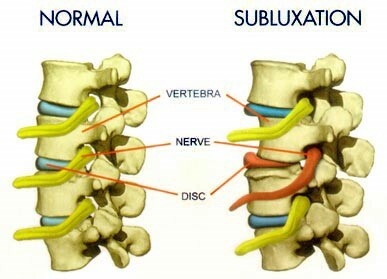 The Chiropractor’s job is to correct subluxation. With specific chiropractic adjustments, balance can be restored back to your body so that your body can, in turn, heal itself from the inside out. By maintaining the full flow of life in your body, you will increase your own inherent healing ability to enable your body to work the way that nature intended. The spinal adjustment is a specific application of forces to realign the spinal column and facilitate the body’s correction of nerve interference. The forces need to be applied with the right amount of pressure in the proper direction at the proper time. Usually this is done with the doctor’s hands but it can also be done with adjusting instruments. Regardless of the different kinds of adjustment techniques, they all have the same goal: To correct or reduce nerve interference. Your Chiropractor in Sierra Vista, AZ - Inline Chiropractic Group - Zerba Chiropractic, P.C.